Urban Decay is one of my favourite cosmetics brands so I'm always excited to hear about a new launch from them. Meltdown Makeup Remover has been specially developed to remove the long-lasting eye makeup which the brand is renowned for. As far as I'm aware, this is the first skincare specific product from the brand and being a skincare addict, I'm keen to find out if this is a sign of things to come. 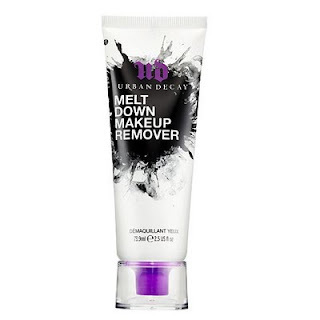 The product is nice enough and if it were from any other brand, perhaps my expectations wouldn't be so high but I was disappointed not to fall in love with this, as I have with pretty much every other Urban Decay product. My first complaint and a big bugbear of mine is that the instructions are pretty much non-existant. I'm not sure if this is because I was testing a sample. I applied the gel-cream to my eyes (dry), massaged in gently and wiped away. I found that I had to double cleanse in order to remove my (not particularly heavy) eye makeup so time wise, I'd say oil based or liquid eye makeup removers are more efficient. Having said this, I really liked the texture- it felt nourishing yet sufficiently gentle and lightweight to use on the eye area without any puffiness. Even the next morning, the skin around my eyes still felt conditioned. It's a pleasant enough product but given the price, I probably wouldn't rush out and repurchase. Instead, I'll continue to budget on eye makeup removers and prefer to invest in one of Urban Decay's uber desirable palettes instead.